The stretch of Vasquez Canyon Road that severely buckled after a landslide in Santa Clarita is attracting skateboarders looking for a challenge. 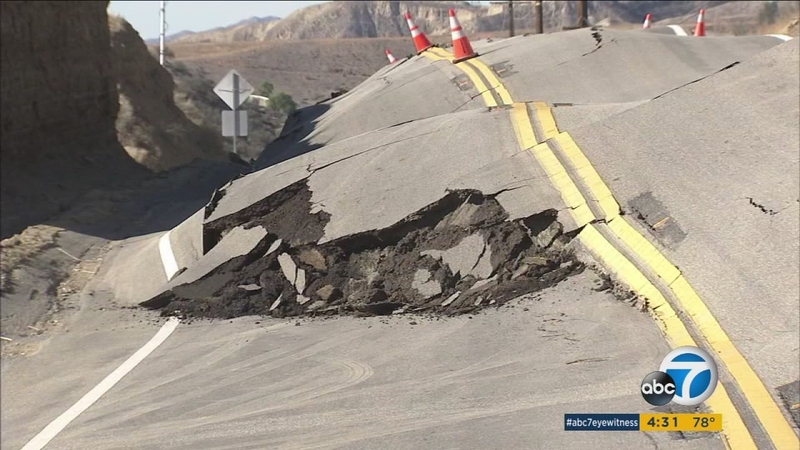 SANTA CLARITA, Calif. (KABC) -- The stretch of Vasquez Canyon Road that severely buckled after a landslide in Santa Clarita is attracting skateboarders looking for a challenge. Photos by photographer Gantry Hill show skateboarder Garrett Hill airborne atop the broken asphalt and also walking on the broken pavement. Vasquez Canyon Road buckled last week, and geologists believe it's due to a landslide in the area. Some said dozens of people were at the site over the weekend. When ABC7 went to the site on Wednesday, there were several people taking photos with the road from the safety of the other side of the fence. But at one point, a man rode over his dirt bike over the cracked roadway. A stretch of Vasquez Canyon Road is lifting and buckling following a landslide in Santa Clarita. Officials with the department of public works told ABC7 if they find someone trespassing, they will call law enforcement authorities to take action.